An NFL player caught on film pushing and kicking a woman at a Cleveland hotel happens to be a “woke” social justice warrior who protested the national anthem at a game last year. During the playing of the anthem prior to the start of a game between the Kansas City Chiefs and the Los Angeles Chargers on Sept. 24, 2017, Chiefs’ running back Kareem Hunt sat on a bench. He had presumably been referring to what social justice activists on the far-left believe to be an epidemic of police brutality against young black males. The problem is that these social justice warriors’ rhetoric rarely matches their actions. Case in point: Flash forward to last week, when a video showing Hunt pushing and kicking a woman in a Cleveland hotel was published online by the gossip website TMZ. “In the video, Hunt is seen arguing with a 19-year-old woman outside of his room at The Metropolitan at the 9 at 3:22 AM on February 10, 2018,” TMZ reported. While no arrests were reportedly made, the release of this footage has at least spurred the Kansas City Chiefs to cut Hunt from the team on the basis that he’d lied to them when the incident first occurred. “The team says when the NFL and Cleveland PD launched their investigations the team called in Hunt and ‘several members of our management team spoke directly to him. Kareem was not truthful in those discussions. The video released today confirms that fact,'” TMZ reported. This means both the team and the NFL had been aware of the incident the whole time yet chose to not even suspend Hunt during its investigation. Instead they let him play. And according to reports, Hunt will eventually get to play again. On Monday the NFL will reportedly announce his punishment, and it’s apt to be nothing more than a lengthy suspension. Because in the NFL it’s okay to abuse but not okay to protest abuse. Now contrast the way the NFL has handled this case with the way it just handled the case of Dallas Cowboys running back Ezekiel Elliott, who was fined over $13,000 last week for tossing his team’s quarterback, Dak Prescott, into a Salvation Army donation bucket in celebration. Football fans don’t seem to like the contrast too much. “I’m trying to find a way to make @EzekielElliott’s investigation and punishment make sense given #KareemHunt and the @NFL’s failure to even interview the victim or Hunt. WTF @nflcommish??? How are you so bad at everything????? ?” one Twitter user wrote. I’m trying to find a way to make @EzekielElliott‘s investigation and punishment make sense given #KareemHunt and the @NFL‘s failure to even interview the victim or Hunt. WTF @nflcommish??? How are you so bad at everything?????? @NFL fined Ezekiel Elliott $13K after he celebrated TD by putting in $21 in the Salvation Army bucket.. But yet NFL didn’t fine or suspend Kareem Hunt for assaulting a woman! But the more glaring contrast is the difference between Hunt’s self-made image as someone concerned about the social good, and the real-life image of him as a temperamental woman beater. Couldn’t bother to stand for the anthem though. Kareem is too woke for that. Beating on women though? Yep no problem there. 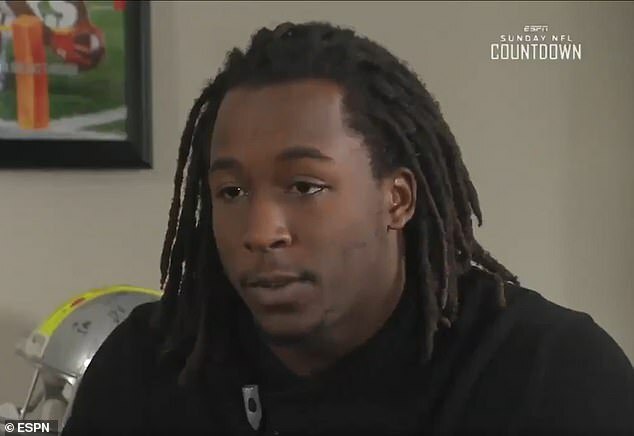 That time Kareem Hunt sat down during the National anthem to protest police brutality.